Here is my survey for cheap travel guide Japan with independent trip or backpacking. From tourist attractions, hotels, transport, to cheap eats in Japan. I hope this post will provide guidance and useful tips for friends who will go to Japan. For airfare tickets, maybe because aircraft fuel prices fell, now airline tickets to Japan is pretty affordable, even for the airline ticket with full service facilities. Many travel fair held, especially in big cities like Jakarta and Surabaya. Starting from Cathay Pacific, Singapore Airlines, until the Indonesian pride national airlines, Garuda Airlines. Unfortunately for the promo price of full service airlines there are black out date, ie the date on which did not apply the promo price, generally on a long vacation or major holidays, such as Eid or Christmas / New Year. Because I seek date with the year-end holidays, Christmas and New Year, my option is to look for cheap flight tickets from budget airlines. Fortunately my traveling companion telling me about cheap tickets from Air Asia to Japan that just exactly what I’m looking for, at the end of December this year. Ticket can be obtained at around 3.6 up to 3.9 million rupiahs, depending on the date of departure and arrival. And of course, for cheap tickets to Japan from budget airlines, you have to booked months in advance. To all of you beginner traveler, that just arrange your first trip to Japan and you want to visit mainstream attraction like me, it is advisable get airlines tickets from Tokyo, then come back from Osaka, or vice versa. Because the cost of public transport is quite expensive in Japan, so to save your budget, you can do one-way from Tokyo to Osaka or otherwise, you do not have to do round trip. JUST INFO: If you’re interested for cheap tickets route round-trip from Tokyo, Air Asia has just opened a new route direct flights Denpasar to Tokyo round trip. Ticket at the end of a long holiday 2017 only for 2.5 million rupiahs round trip. The first trip to Japan, my itinerary route is still the mainstream route for the beginner. I visit some cities that are famous for tourist spots in Japan including Tokyo, Osaka, Nara and Kyoto. In addition to those who like landscapes, definitely want to see the view of Mount Fuji, from Hakone or Kawaguchiko. A place of interest in Japan which is now booming & begin to viral in social media is Shirakawago Village, famous for snow-covered rural landscape in the winter, just like Santa Clause’s house. Also there is Tateyama Kurobe Alpine Route, that only opened at certain moments, in which you can pass through the wall of ice in the left & right side of the street. Since I was one of the lovers of World Heritage, whenever I travel to a country, I don’t forget to always check the list of World Heritage in the country.. The first choice for the single traveler, of course, you can stay in the dorm, or perhaps some sort of capsule hotels in Japan. Another option, I had read an article about the internet cafe in Japan, where we could buy a package of the night, from midnight until the morning in the cafe private booths. Many backpacker traveler who uses this internet cafe booth as place to get some sleep. Airbnb, a kind of apartment rent, the minimum for 2-3 nights. Khaosan Hostel. Hostel from Khaosan Group is quite widely spread in Japan. Sakura Hostel. Special to Tokyo, you can try the Sakura Hostel. J-Hoppers. While in Osaka and the surrounding area, there are J-Hoppers hostel. Toyoko Inn, a budget hotel chain in Japan. Toyoko Inn for this, they provide a free shuttle bus to their guests. Comfort Hotel or the Comfort Inn Hotel, a budget hotel network of Choice Hotels. Supermarkets in Japan. There are many options such as Lawson and Family Mart Supermarket which is a local supermarket chain in Japan, up to 7-Eleven. Don’t forget to wait for discount “ready to eat meals” in supermarkets, generally above 8 pm. Vending Machine, hehe .. Yes, in Japan, the “paradise” of its vending machines, even the food is also available in vending machines this. There are a wide selection of hot food in the vending machine, which has been heated first. Even an Anthony Bourdain ever tried to taste food in vending machines Japan. In addition there are many lists of local fast food chain in Japan, such as Co Co Curry House, Matsuya, Sukiya, Hanamaru Udon or Yoshinoya. Live your search in google map, where the nearest branch of where you stay, or a branch adjacent to the sites you visit. While the list of local fast food chain with a menu of western food, you can try on Saizeriya, Denny’s Resto, or MOS Burger. To take away, Hotto Motto including the widely recommended by a traveler. Cheap price with a considerable portion. For you who like sushi, do not forget to stop at the resto’s conveyor belt of sushi for 100 Yen only. Which is quite popular and has many outlets for 100 Yen Sushi include Kura Sushi & Kappa Sushi. Ichiran Ramen. Excluding the list to eat cheaply in Japan, but must try! Because it’s a ramen menu which is popular, both in Japan and other countries in the world. Ichiran Ramen is Japanese ramen which already has many branches in the world. I think the price is still affordable, almost equal to the price of a typical Japanese ramen in Indonesia. IC Card Tokyo: Pasmo & Suica. Day Pass Tokyo Metro, ranging from 24 hours to 72 hours. Applicable to Tokyo Metro and Toei Subway Lines. For the areas Kyoto, Osaka and surrounding areas, there is a Kansai Thru Pass. As for the Osaka city alone, there are various day pass. To Kyoto, there are cards for buses, namely Kyoto Bus Pass. There was also FREE bus in Tokyo. Www.hyperdia.com sites, to calculate the costs and choice of routes that you can go from one place to another in Japan. For transportation outside the city, if all you need is the speed of time, of course Shinkansen (fast train) in Japan is the most reliable. But if you want to save money, Willer bus can be an alternative. In several towns, there are also other Willer bus, such as Nohi (Nouhi) Bus Takayama. www.japan-guide.com among the most complete in my opinion. 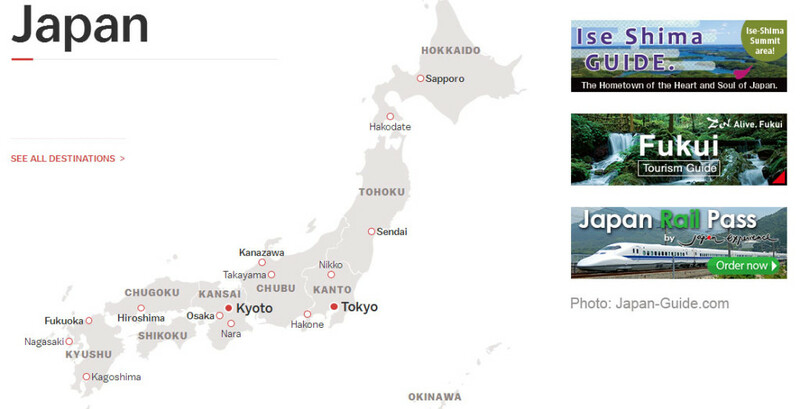 Starting from the transport info to the various tourist spots in Japan. Trip Advisor. Both websites I mentioned last is the website which is often a reference for independent traveler in search for information about traveling in various countries around the world. There are a variety of information ranging from where to eat, hotel, transportation, to the tourist spots in Japan. So that’s it, my survey for tips & cheap travel guide Japan. I will survey again, hopefully I can provide more information about cheap travel guide Japan, of course, before I make my first trip to Japan. I hope this post can help! ? If you can add some information about Cheap Travel Guide Japan, please posting in comments below. Very much appreciate!